A couple of weeks ago I got a little bit carried away during practice, and now my lower back and hamstrings are paying for it! Even after years of practice, some lessons are to be learned time and time again. This is not a bad thing at all. It is just one more opportunity to step back, be mindful, and go a little deeper. As Ashtangis, we constantly need to determine the difference between sensation, discomfort, pain, and all of those nuances. Practice was feeling better than it had in a while. Everything was light, easy, and graceful. After teaching with Greg in Purple Valley, I had cultivated that magical India energy and brought it with me to Fort Lauderdale. It was lovely. Then, one day during the lift in Dwi Pada (nava position), something felt off and weaker. I couldn’t keep the toes pointing and I fell out of it. Here’s when the ego kicked in. I thought, “Hey I didn’t get it perfect the first time, why don’t I just do it again?” Probably not the smartest decision I made that day. Later on, when my body cooled down, I had to recognize that something in my lower back and left leg had been pulled in Dwi Pada… and not in a pleasant opening kind of way. I had to travel days after that for another teaching trip, so my practice mutated to support my travel, which means shorter, kinder, softer practices. This helped! But after coming back home I thought I could just resume my normal practice, and now I realize that I need to listen and slow down. My approach to tweaks, pains, and injuries is pretty straightforward, listen to your body, be intuitive, and do what feels right within the context of the sequence. Trust and have faith the body will heal when approaching the practice in a therapeutic way. Explore the “healing edge”, which is what I call the point right before those sensations in the body become bad, sharp, tearing pain. Breathing in the healing edge has cured me before, and giving myself permission to let the outer form of the posture be what it needs to be is key for lifelong practitioners, which I do aspire to be. Yes, it can be frustrating for the ego to back off performance. Sometimes, for Ashtangis, it is hard to take it a little bit easier. As westerners, we are so conditioned to always work hard, always give our best, always stay on top. However, it can be strong therapy for the mind as our thought processes become more apparent to us when we practice through pain. It forces us to explore with honesty our motivations to getting on the mat. And it perhaps encourages us to look a little deeper at the other limbs of Ashtanga Yoga. For example, it can’t be about the asana for me right now, but what a great opportunity to direct my efforts towards reading yogic texts or practicing Santosha or contentment, whish is one of the niyamas (second limb of Ashtanga Yoga). It’s a choice whether this is going to be frustrating or positive. Heels come and go in Kapotasana, knees need to bend in awkward places, Janu Sirsasana C takes the place where Eka Pada used to be. It is fine. 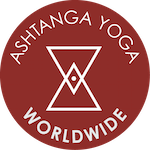 Ashtanga Yoga is strong medicine, and when we go through pains in our body is when we need this medicine the most. I can choose to see this as an opportunity to back off, learn something new, and practice patience, which are all good things to learn for our yogic lives off the mat. The healing edge is there to transform us whenever we are ready for it.